So, Selenium is an open-source toolset for testing web-based applications. It can be found here. I started working with Selenium recently and I though it’d be an interesting post to document how I went from novice to competent user. One of the interesting features of Selenium is that is can be used for performance testing. It’s my experience that performance testing is a costly business, so to see an open-source tool that can do it is rare. 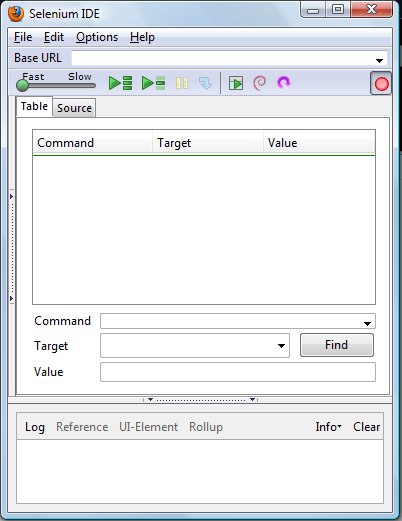 Selenium IDE – the scripting environment. Selenium Grid – Allows for multiple tests (or instances of the same test) to be executed. It seems to me that the IDE and RC are doing the job of Loadrunners VUGen and Grid is handling the tasks of the controller. More on this in a future post. At the time of writing, Selenium IDE is available as an add-on for the Firefox browser only, though the tests can be replayed (via RC) on Firefox, IE and Chrome. Installation is made easy with the availability of 3 zipped packages (core, rc and grid) and the inclusion of the IDE as a firefox extension, (xpi) which will automatically install into firefox. The folks over at Selenium HQ also recommend getting an element inspector for your browser. As all the Selenium scripting I’ve done is in Firefox, Firebug is highly recommended, and freely available as an add-on or from http://getfirebug.com/. Start by installing the IDE into firefox, and unpack the zip files somewhere sensible.